In Windows it is only possible with Windows Task scheduler to automatically shut down the system but it is not so user friendly and some users review that it is not a pleasant built-in tool. By Wise Auto Shutdown you can easily schedule your system and manager shut down, log off, restart, hibernate, sleep and close power on daily basics at fix time, at specified time or by setting time from now. Moreover you can click over check box “Please remind me 5 min before the task is executed”. This will notify you 5 min before performing the task and help you to close all the running task or save the important documents. Following are the reasons for Why to choose Wise Auto Shutdown? 1 Free Of Cost -It is a free software.Users can use this application free ,update it and also provided free technical support. 2 Easy of Use - It has good as well as user friendly interface. Hibernate – Changes the power state to hibernation. Log off – Logs off the current user. Power off – Powers down the PC. Restart – Will restart the PC. Shut down – Shuts down the system. Sleep – Puts the PC to sleep. 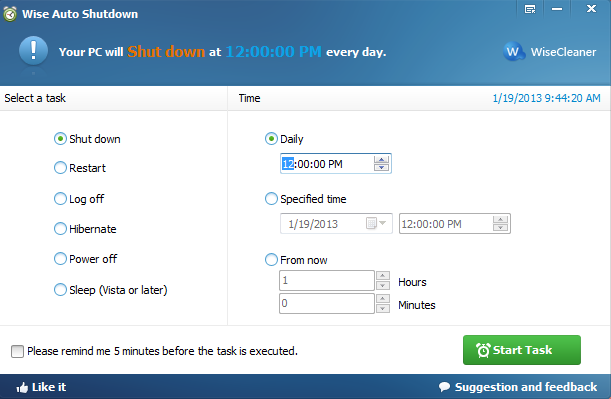 4 Various ways to specify time- Wise Auto Shutdown can finish various time to perform task. Daily - For performing task at fix time. Specific time- For performing task at specific time in a day. From now- For performing task after few hours or minute from now . 5 A warm and timely reminder- Wise Auto Shutdown provide a option of warm and timely remind 5 min.before performing task.To do this just click on check box at the below. 6 Silent running mode- A very good thing in this software that its run silently by without producing any pop-up like other software as well as perform its task smoothly .